Milk production is one of the most important sectors in Latvia’s agribusiness industry. Moreover, it is a sector with significant manufacturing potential. Comprising almost one quarter of total agricultural product output, it is Latvia’s second-biggest agricultural sub-sector. Significant land resources suitable for milk production are still available in Latvia. This could significantly increase agricultural and food production output, as well as the volumes of added value produced within these sectors. In 2013, the structure of the utilisation of agricultural land shows that 59% or 1,154,000 ha of the total agricultural land in use was only occupied by forage crops providing products for use in the feed of herbivorous animals. Even assuming a very extensive level of the use of land (2 ha of land per 1 unit of beef), this is a resource for the rearing of at least 550,000 cattle. However, at the end of 2014, there were only 422,000 cattle including 166,000 dairy cows. This means that if the current structure of and extent of the use of agricultural land was preserved, using the existing forage base, there is an opportunity to engage at least 130,000 more units of beef in the production of livestock products. 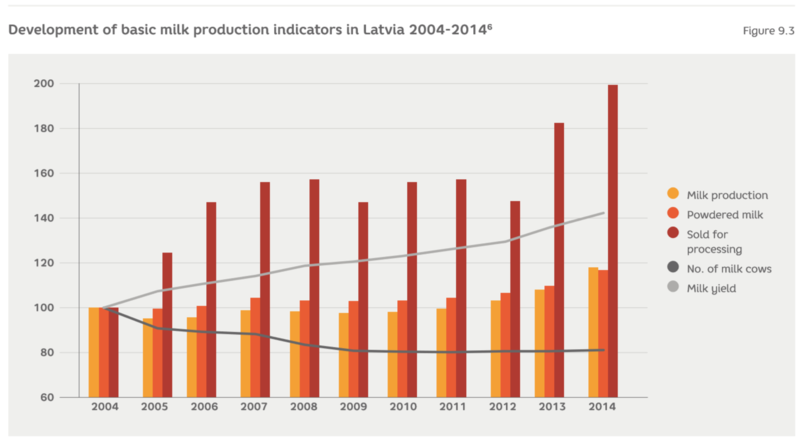 Even though the productivity indicators for milk production in Latvia are significantly below the EU average, progress made in recent years in increasing milk yield from cows has enabled Latvia to not only maintain, but actually increase its market share of the EU’s total volume of milk production, despite the relatively constant number of cows. This determines the comparatively great extent to which the well-being of Latvia’s milk production sector (as well as that of the industry in the Baltic states as a whole, because the situation in Estonia and Lithuania is similar) is dependent on its export capacity, bearing in mind that the product exporting structure could be determined either by processed milk products (if the processing industry is competitive) or fresh milk (if this industry loses out to foreign competitors). In Latvia’s case, the largest share of the volume of sold milk (65%) is exported in non-processed or else in slightly processed form of (skimmed milk concentrate or cream). However, on an EU scale, the total volume of Latvia’s dairy sector is very small, making up only 0.6% of the EU’s total milk production volume in 2013. In contrast, Germany and France together made up over half of the total EU milk market with 28.6% and 23.4 % market shares respectively, and together with the United Kingdom accounted for 2/3 of the EU’s total milk production volume. This means that the small volume of Latvia’s dairy sector gives rise to the hope that it would be possible to not only find an export market outside the borders of the EU, but also within the EU, either through positioning as a relatively cheaper product, or as a special quality niche product for suppliers in the overall EU market or some segment of it. Milk production is very fragmented: at the start of 2015, there were 21,800 dairy farms. Even though the number of dairy farms has been reduced by a thirds from the corresponding figure of 61,200 a decade ago, there are still many hobby farms with up to 10 dairy cows. In 2015, there were 18,700 such farms with 41,000 dairy cows, along with 2,520 farms with 10-50 cows (auxiliary farms) with a total of 50,000 dairy cows. However, modern technological capabilities point towards a market-oriented dairy farm having no less than 50 dairy cows. There were only about 500 such farms in Latvia in 2015 making up ~43% of all dairy cows, similar to the corresponding figure for Lithuania where dairy cows on such farms comprised 34% of the total dairy cow population. However, in contrast, in 2013 dairy cows on market-oriented farms in Estonia made up 86% of the country’s total number of dairy cows. A further reduction in the number of dairy herds is likely during the next 10 years, parallel to which the size of the average market-oriented dairy farm’s grazing herd will exceed 100 dairy cows. The formation and operation of over 1,000 such farms would require a significant influx of new qualified personnel into the industry, posing a challenge to professional education and further education systems. The fragmented structure of dairy farms is one of the additional factors which determines the relatively low efficiency of the dairy industry in Latvia, not only at the level of dairy farms, but also at that of the milk processing industry. It could well be that the small farming market was one of the factors that has determined that, since accession to the EU, milk procurement prices in both Latvia and Lithuania have been the lowest in the EU Single Market. 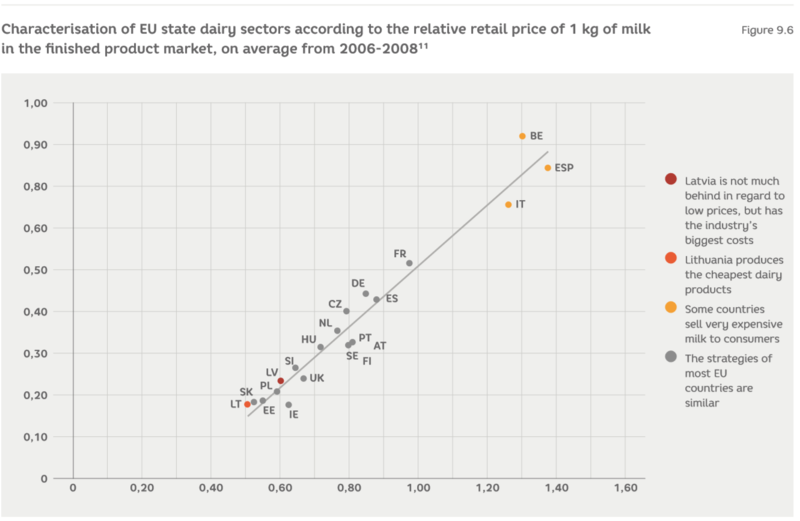 At the same time, in Ireland, which is a milk exporting country, during the past decade milk procurement prices have been approximately at the average level of the EU-15, as is the case in Germany which is the biggest milk producing country in the EU Single Market. Even though the gap to the average EU-15 purchase price level has narrowed slightly during this period, the difference before that was only less than EUR 5/t for a few months. Moreover, the slump in all EU milk markets has caused a comparatively deeper decline in the fresh milk market in Latvia. 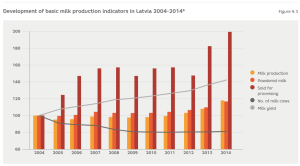 Since the market crisis of 2008-2009, the recovery in Estonia has been faster, and compared with Latvia, prices have stabilised at a higher level. 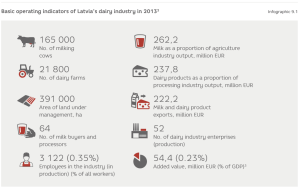 Latvia’s dairy industry is characterised by heightened sensitivity in relation to the unavoidable crises in the global dairy product market, which cause deeper declines in the retail price of milk throughout the EU Single Market, as a result of low competition and market strength. This has a significant bearing on the stimuli for the development of the industry, making this sector an investment risk zone in the eyes of credit institutions, despite general forecasts predicting the stabilisation of the global dairy market, which, given the existence of a competitive farm production structure and organisation, would serve to ensure a sufficient investment repayment level. The weakness of Latvia’s dairy production sector is also characterised by its dependence on the Lithuanian milk processing industry. Every year over 200,000 tonnes of fresh milk are exported to Lithuanian companies for processing into products that can be sold on the market. 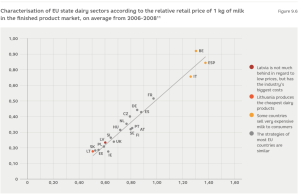 The deep integration of both countries’ fresh milk market and the relative weakness in the market of Latvian milk producers since 2010 is also indicated by the level of milk procurement prices, which is practically the same in both neighbouring countries but differs from that in Estonia. The relatively lower milk procurement price is firstly the outcome of milk producers’ weakness in the market, which dairy farms have tried to counteract since 2002 by founding joint dairy sales and processing cooperatives through which they have sold milk, initially even attaining good results. Secondly, it is the consequence of the Baltic milk processing industry’s overall lack of competitiveness within the EU Single Market. Similar to the Polish, Slovakian and Irish processing industry, within the EU the Baltic milk processing industry is actually characterised by the smallest amount of value added per processed tonne of raw dairy material. At the same time, compared with the aforementioned countries, Latvia has the biggest inter-consumption costs within processing process itself. This defines the country’s milk processing industry as one characterised by production of low priced products with comparatively high processing costs (see Figure 9.7). Concentration of investment into export-oriented enterprises. Investment support from the state should only be provided to projects aimed at manufacturing exportable products with significant potential market strength, whose business plans envisage the payment of at least the EU average milk procurement price to suppliers of quality dairy raw materials. Establishment of a system to insure revenues against deep short-term market crises. This system should combine the solutions offered by the capabilities of the European Agricultural Fund for Rural Development Fund, with a privately devised system of deposits, which would be formed and run by private insurance companies under the auspices of a specially created product or the industry’s own self-help system, adapting legislation accordingly. Recommendation 3 – Increase and multiply the knowledge of players responsible for the efficient development of the dairy sector, i.e. product developers, farm managers and workers. Formation of a system that raises professional qualifications to provide upwardly mobile export-oriented enterprises in the milk processing industry with international level technological management specialists. 2 LR MoA Annual Report on Agriculture. 2014 and EUROSTAT data. 2015. 8 The authors’ calculations according to EE Statistics and LDC data. Note: in Latvia and Estonia in 2013 and in Lithuania in 2010.
International Scientific Conference “Research for Rural Development 2010”.